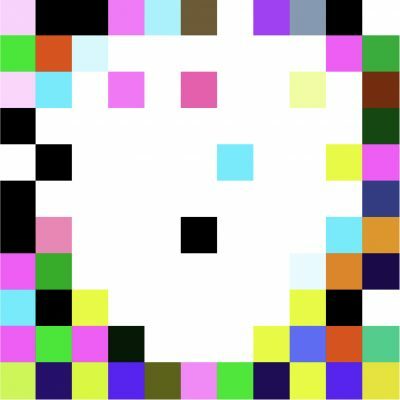 What do we see when we look at squares of colour? If the artist is Marko Vuokola (born 1967), we might see a sharpened picture of the waters of the Tammerkoski Rapids in Tampere, Finland, a waterfall in Norway, or the planet Venus. Marko Vuokola has travelled in Norway, photographing a waterfall at Flora with the aim of arresting the extremely fast and abundant movement of the water. 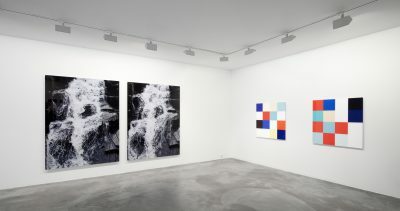 The result is a pair of images entitled The Seventh Wave – Flora of two different moments of water flowing, falling, surging and being thrown. These pictures are something that we could never see with the naked eye in a real situation. They are a reminder of the hectic nature of things taking place – even in life – of a flood of information that prevents viewers from seeing, distinguishing and perceiving. When the image is arrested, each detail can be observed as a form. 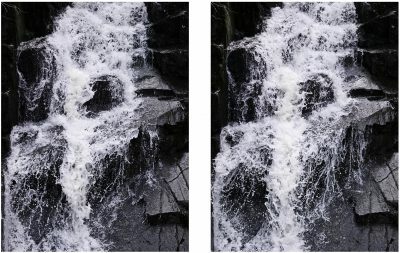 The artist then zoomed to the centre of both waterfall image files in Flora (sharpen), enlarging from them the sixteen most central pixels, the smallest individual parts of the image. We now see squares of colour. Although the waterfall pictures seem to be black and white, they are in fact colour images and when the picture is sharpened enough we can see the colours hidden in it. Venus (sharpen) was made in the same way by zooming ”deep” into the file of an image of the planet Venus taken with a high-quality digital camera. The result is a large surface of colour squares, an abstract journey into space. This is as close as we can ever get to Venus. Sense and sensibility is a video piece displaying in superimposed fashion two video recordings made at night of the same lighthouse. One was filmed with a tripod, keeping the flashes of the lighthouse in place, while the other one was filmed with a hand-held camera, making the light of the lighthouse move along with the video photographer’s unintentional movements.